A-Z Appliances Heating and Cooling sells high quality air compressors from leading name brands in the industry. 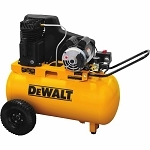 We carry air compressors from brands such as DEWALT, Makita, Speed Aire, Jenny, Industrial Air, Kobalt and more. We ship our air compressors throughout the US and North Carolina including Charlotte, NC, Greensboro, NC, Winston-Salem, NC and High Point, NC. Make sure to check out our discount home appliance warehouse where we also sell heating systems, discount kitchen appliances, home air conditioning systems and other discount appliances.